Rural and remote, lushly beautiful but little known, Bierzo is the kind of region wine lovers dream of discovering. This verdant DO in northwestern Spain, whose hilly, castle-studded landscape is hemmed in the mountains between Castilla y León and Galicia, was virtually unheard of a decade ago. Yet today this former Roman mining area has a promising future as one of Spain’s new wine hotspots. It’s a region where mineral-rich slate soils, a continental climate, and intrepid winemakers have come together to create some truly memorable red wines. The Mencía grape is the star here, where it occupies nearly two-thirds of the vineyards. A variety cultivated almost solely in northwestern Spain (especially in the Galician DOs- appellations- Valdeorras, Monterrei, and Ribeira Sacra), Mencía has only recently come into its own as a respected grape variety. In good hands, it reveals fresh fruity notes, smooth tannins and an enviable reflection of the minerally terroir. Although known as a wine that shows very well in young, fruity wines, some Bierzo producers are proving that with the right balance of oak it can also age well. Other grape varieties planted in Bierzo include Garnacha Tintorera, Godello, Doña Blanca, Malvasía, Palomino and, in experimental quantities, Merlot, Cabernet Sauvignon and Tempranillo. The vineyards themselves are among the most beautiful in Spain. Many are planted in picturesque terraces along the steep slopes of the Sil river valley, some with such marked inclination that mules are used for the harvest. The soils range from alluvial near the riverbed, to rocky and slate-filled on the higher slopes. The vineyards, which are planted at elevations of up to 1000 meters, enjoy moderate rainfall and, thanks to the mountains that protect them from the whims of the Atlantic, a relatively mild climate. Bierzo owes a good dose of its current fame to winemaker Alvaro Palacios, who is credited with putting the Priorat region on the map in the 1990s. Palacios and his nephew, Ricardo Pérez, are behind Descendientes de J. Palacios, one of the best wineries of the region. Other can’t-miss bodegas include Dominio Tares, Prada a Tope (a whimsical winery also known for its grape-based beauty products), Pittacum, Bodegas Estefania, Castro Ventoso, Bodega del Abad, and Paixar (a winery run by the sons of Mariano García, one of Spain’s top winemakers- ex winemaker of Vega Sicilia and the founder of Tudela de Duero’s Mauro winery). 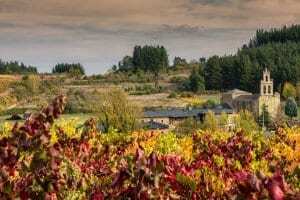 The heart and soul of Bierzo is Cacabelos, a buzzing market town and an important stop along Spain’s legendary pilgrim’s route, the Camino de Santiago (St. James Way, the Pilgrimage that takes place every year and culminates in Santiago de Compostela). Although the wine business is centered here, this pretty riverside town is hardly Bierzo’s only attraction. Large towns like Ponferrada and Vilafranca del Bierzo tempt with Templar castles, medieval monasteries, and once-extravagant palaces; while the smaller wine hamlets of San Roman Bembibre, Arganza and Corullon seem hardly touched by time. The presence of the Camino de Santiago has made Bierzo a natural place for the foundation of monasteries and convents, which abound both in villages and in the countryside. Don’t miss the Monasterio de Santa Maria de Carracedo, a 10th-century monastery outside Carracedo. The countryside itself, with its rolling hills, lush river valleys, and green peaks, is a draw as well. The Camino de Santiago provides the perfect way to soak up the scenery on foot or by bicycle. An essential stop in the area is Las Médulas, a Roman gold mine outside Ponferrada. A maze of tunnels burrowed in the ruddy red rock, Las Médulas is a stunningly beautiful UNESCO world heritage site.